I'm slowly checking off items from my to do list. Next on the list was to make a pincushion for a swap with several other modern quilt guilds; Austin, Boston, Indianapolis, Kansas City, North Virginia, Vancouver and Wichita. I was so excited when Kansas City invited us to participate. I often think of the modern quilt guilds as one big extended family and it's great when there is an opportunity to meet and get to know some fellow guild members a little better. When I was explaining the swap at our last meeting, I said it was like having a modern day pen pal, but with handmade goods and pretty fabrics. This is a blind swap, in that we don't know who is getting the pincushion we make and we don't know which pincushion we are getting in return. Sometimes that makes it hard to decide where to start with your design. What colors? What fabrics? What size? What filling? See??? It's not easy. I've done several swaps now and one thing that helps me get started is to make something that I would love to receive. On Friday I made a Wildflower Pincushion using prints from Field Study, both the pattern and the fabrics are by Anna Maria Horner. I really want to keep this one. It's big and bold and beautiful!! Check out that center print. 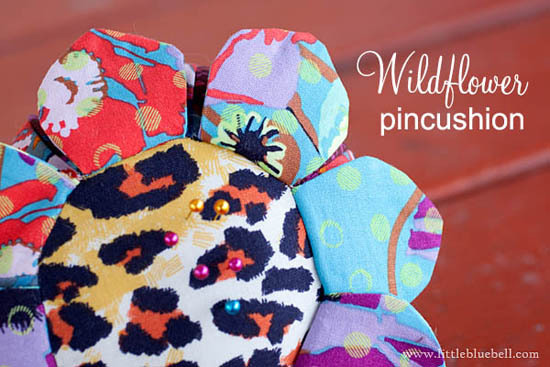 It puts the WILD in wildflower, don't you think? I found the pattern here (warning there are missing diagrams, but the steps are written out). If you need a little more help, Kim at bitty bits and pieces has some great tips on her blog. I love the way she handles the small petal pieces. 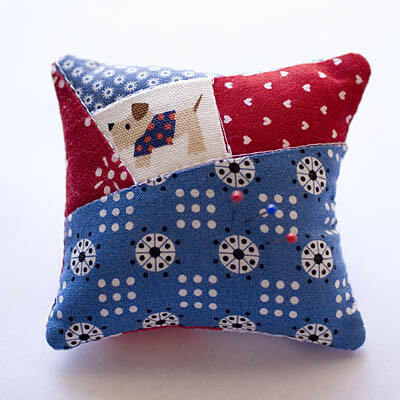 I've made a few pincushions over the years, usually they are tailor made to the recipients tastes. 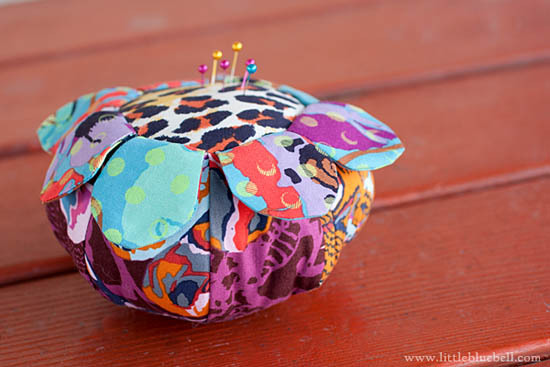 Pincushions are fun to make because they don't take up too much time and since they are small, you can use bits of special fabric. This one is all mine! That cute puppy was begging to be fussy cut. I added fabric one piece at a time until it was big enough. Did you see that great bandana fabric from Katie Jump Rope? Sigh, I will never get tired of that print. 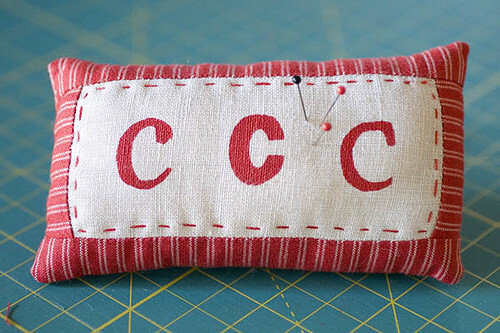 This pincushion was for a swap a couple of years ago and my partner had a thing for typography. I made a stencil by tracing the letter C in a few different fonts and cutting it out. Then I hand painted them onto linen. Next I framed it out and added just a touch of hand stitching. Even though this is two years old, doesn't it look oh so trendy now? Here is another color coordinated pinnie. This one was for a swap and it matched a pillow I made for my partner. 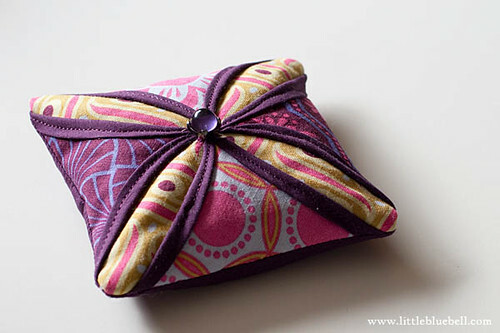 My friend Kim from My Go-Go Life wrote this tutorial, the Cathedral Window Pincushion. It's fun and easy to put together. It looks a lot more complicated than it is. 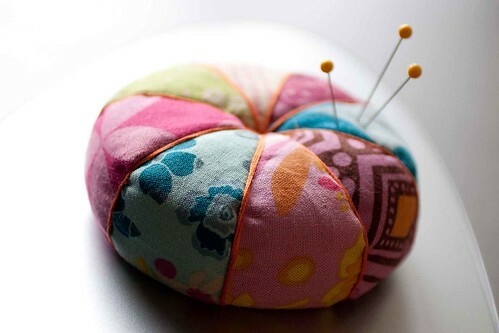 Alright, what do you think makes a good pincushion? Is it the size? The stuffing? The FABRIC?! For me, it's the fabric plus little details (hand stitching for example). These are all so cute! You are a pincushion machine! I had no idea you had made so many. I like small projects, because you can put small touches, like hand stitching, on them and you are not committing to a life long project. I love all the pincushions. The one with the little dog is my favourite. 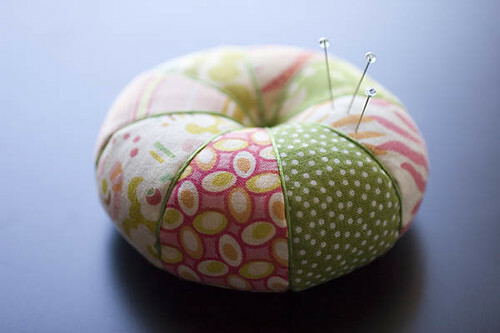 I definitely think it is the fabric that makes the pin cushion. Fantastic! I sure hope I get yours in the swap ;) Love the roundup too! I would be thrilled to have your wild flower come home with me! You've certainly made a lot of beautiful pincushions!